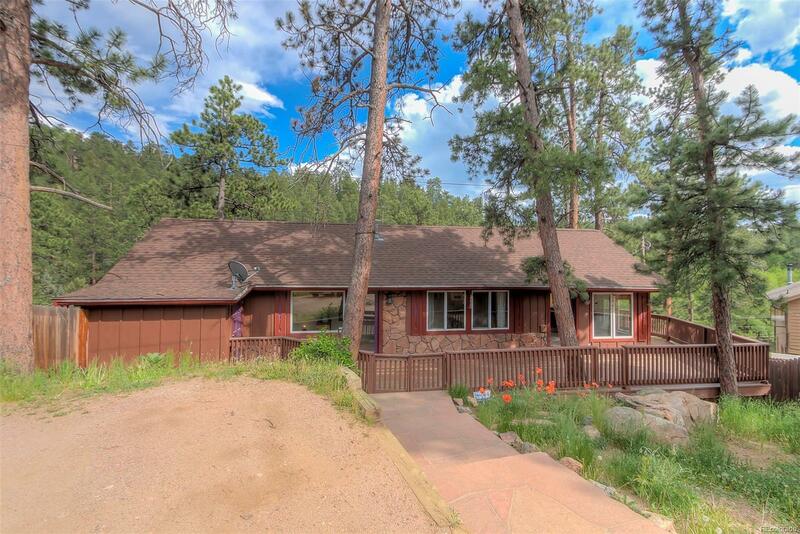 Wonderful investment offering and/or rare opportunity to live "by the lake" in Evergreen!! This charming mountain bungalow has been recently updated with a new roof in 2012, exterior paint in 2013. The open concept of the dining room, living room, eat-in kitchen with Corian countertops and breakfast nook makes for easy main floor living with a main floor master suite. This artisan home features terra cotta tile, wood floors, and a gorgeous cove ceiling in the dining room with original half log siding with stone. Custom built-in shelves, large closets, and clever use of space offer more than ample storage. The walk out basement has two additional bedrooms with large separate closets, a second bath, laundry, and plentiful storage. This home offers a unique opportunity to live steps away from the Evergreen Lake and historic downtown Evergreen.